Evil works and comes as an angel of light. After all Lucifer, Satan the Devil was and is an angel who was cast out of Heaven. He knows all the tricks to use human emotions and twisted logic that tickles the ears of those who want to believe in something.....something percieved as good. How do we know if it is lies or the truth in a world filled with confusion and division. There is only one choice and that is to seek only the Truth, absolute Truth as found in evidence and only evidence. Humans think that if one thing is true it implies the faith base religion of "Evodelusionism". 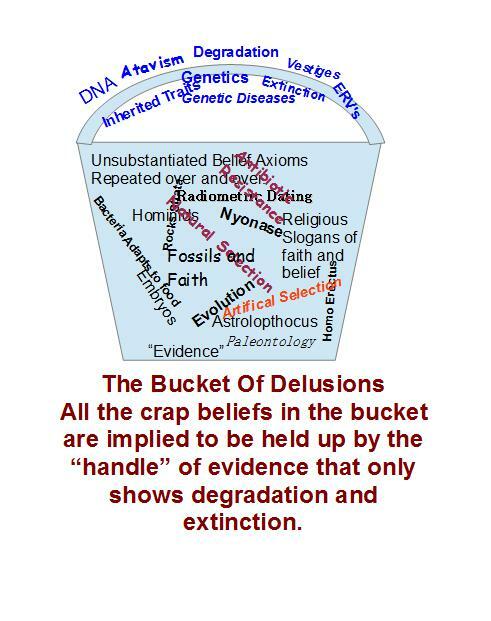 The Bucket of delusions are supposed to be supported by evidence, which only shows the direction of genetic degradation which only leads to extinction. By the way everything in the bucket has been proven to be clear evidence of CREATION and a much higher level of fitness at the beginning.